The other day I received a prospecting email that really impressed me. 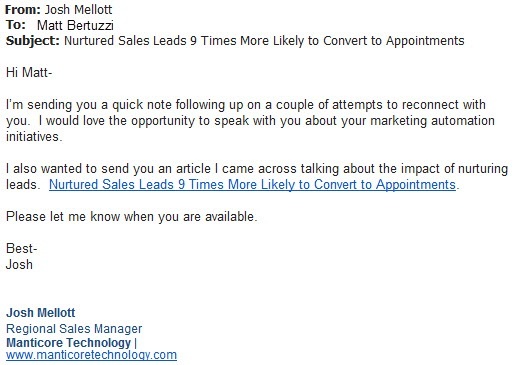 The seller, Josh Mellott from Manticore Technology, was putting me through a well-executed prospecting process – combining voice and email touches. Before I share his response, I have a question for you. Faced with this email, how would your reps have responded? Reps will disengage, mark for nurture and are never heard from again. So happy to have an actual email reply, the rep will rush to close on a meeting. Any trace of the objection will be buried under client quotes, benefit statements, ROI metrics and anything else that happens to be at hand. Rather than ignoring the objection, or burying it under a mountain of other data, the reframe is about acknowledging, redirecting & teaching the prospect to see something in a new light. I hope I haven’t tipped my hand too much as to which category I prefer. In fewer than 40 words, Josh acknowledged my objection, redirected my line of thinking and showed me a perspective I’d hadn’t even considered. This is what a Reframer does. And this is powerful selling.